National Hardware Disc Magnet, Series: N302, 1/2 in Diameter, 3/16 in Width, Ceramic 5 National Hardware Disc Magnet, Series: N302, 1 in Diameter, 5/32 in Width, Ceramic 5 Made with Eklind alloy steel that has been heat treated for optimum strength and ductility with a black finish to resist rust; handle width is 3 inches. Made with Eklind alloy steel that has been heat treated for optimum strength and ductility with a black finish to resist rust; handle width is 3 inches. Flexible magnetic tape is adhesive on one side, magnetic on the other. Perfect for making lightweight projects magnetic. Can be used in the home, school and office. Made with Eklind alloy steel that has been heat treated for optimum strength and ductility with a black finish to resist rust; handle width is 3 inches. Unlimited use in shop, store and home; use to hang small spotlight, signs, keys, utensils, draperies and more from any ferrous metal surface. Includes a special liner to prevent surface scratches. Use on file cabinets, lockers, refrigerators, desks and more. Strong enough to keep those important lists, memos and letters from sliding out of sight. Made with Eklind alloy steel that has been heat treated for optimum strength and ductility with a black finish to resist rust. Includes metric sizes: 2MM, 2.5MM, 3MM, 4MM, 5MM, 6MM, 8MM and vinyl pouch. Carded. Add a hook or a knob and use this magnet for holding and positioning shop lights, tools, plants and more to steel surfaces such as refrigerators, filing cabinets, metal beams, walls and doors. Master Magnetics Magnetic Hook, 1-1/2 in Diameter, 14 lb, 7/8 in Projection, 2 Hooks, Vertical Mounting, White Enamel, For Hang Lights, Keys, Wiring Tools, Banners and Decorations Drop forged high carbon steel; fully polished finish resists rust and corrosion; hardened and tempered sharp cutting edges; non-slip vinyl comfort grips; hardness meets or exceeds ANSI standards. Made with Eklind alloy steel that has been heat treated for optimum strength and ductility with a black finish to resist rust; handle width is 3 inches. 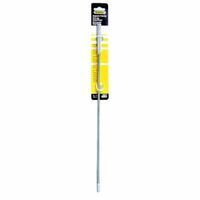 Wilmar Magnetic Pick Up Tool, 8 lb Load Capacity Made with Eklind alloy steel that has been heat treated for optimum strength and ductility with a black finish to resist rust. Includes inch sizes: 5/64, 3/32, 1/8 , 5/32, 3/16, 7/32, and 1/4 and holder. Also known as rare earth magnets, these powerful permanent magnets are made of neodymium, the strongest magnet material available. Can also be used as a door latch. Used in woodworking projects, attaching name badges to clothes, science experiments. Also known as rare earth magnets, these powerful permanent magnets are made of neodymium, the strongest magnet material available. Can also be used as a door latch. Used in woodworking projects, attaching name badges to clothes, science experiments. Also known as rare earth magnets, these powerful permanent magnets are made of neodymium, the strongest magnet material available. Can also be used as a door latch. Used in woodworking projects, attaching name badges to clothes, science experiments. Extra torque 8650 chrome nickel alloy, heat treated for maximum strength, and rust resist finish. Made with Eklind alloy steel that has been heat treated for optimum strength and ductility with a black finish to resist rust; handle width is 3 inches. Strong, plastic clip with rubber handles contains powerful neodymium magnet. Post notes, hang decorations and more. Use as a pointer or to pick up objects in hard to reach places. Features a powerful neodymium magnet on the tip. Used to magnetize and demagnetize screwdrivers, nut drivers, wrenches, taps and small tools; converts any tool blade into a magnetic retriever for screws, nuts and metallic particles. Drop forged chrome nickel steel for durability; fully polished finish resists rust and corrosion; precision milled tapered jaws; hardened and tempered wire cutter; ergonomic anti-slip cushioned grips for comfort and less hand fatigue; hardness meets or exceeds ANSI standards. Each magnet features easy-grip knob for positioning and non-scratch liner to prevent marring. Holds calendars, important memos, visual aides and more with these convenient, heavy duty magnetic bases; knob is 1-1/4" tall. Used in offices and classrooms. Made with Eklind alloy steel that has been heat treated for optimum strength and ductility with a black finish to resist rust; handle width is 3 inches. Made primarily from aluminum, nickel, cobalt and iron; powerful and sturdy and includes a keeper to help retain magnetic power. Used by crafters, teachers and do-it-yourselfers. Made with Eklind alloy steel that has been heat treated for optimum strength and ductility with a black finish to resist rust and a classic steel handle. Includes inch sizes: .050, 1/16, 5/64, 3/32, 7/64, 1/8 , 9/64, and 5/32. Carded. Sturdy clip easily attaches magnet to belt or pocket; used by mechanics, carpenters, electricians and do-it-yourselfers to hold small hardware, nails, screws, wire nuts and more securely and conveniently. Can be bent to reach almost any location. Use to retrieve lost items from engines, dashboards, drains and vents. Two-position, adjustable joint design used for grasping and turning; slip-resistant bi-material handle for a comfortable grip; drop-forged steel is strong and durable; meets ANSI specification. Drop forged high carbon steel; nickel plated rust resistant finish; tempered and heat treated for hardness; hardened milled jaws for maximum grip power; built-in wire cutter. Drop forged high carbon steel; chrome plated rust resistant finish; tempered and heat treated for hardness; precisely milled jaws for grip power. National Hardware Magnetic Base, Series: N302, Round, 2-5/8 in Diameter, Ceramic 5 Magnet, Nylon Body Drop forged high carbon steel; fully polished rust resistant finish; tempered and heat treated for hardness; comfortable non-slip grips. Extra torque 8650 chrome nickel alloy, heat treated for maximum strength, and rust resist finish. Made with Eklind alloy steel that has been heat treated for optimum strength and ductility with a black finish to resist rust. Includes inch sizes: .050, 1/16, 5/64, 3/32, 7/64, 1/8 , 9/64, 5/32, 3/16, 7/32, 1/4, and molded plastic holder. Made with Eklind alloy steel that has been heat treated for optimum strength and ductility with a black finish to resist rust and a classic steel handle. Includes inch sizes: 5/64, 3/32, 7/64, 1/8 , 9/64, 5/32, 3/16, 7/32, 1/4. Carded. Forged steel construction with rust resistant finish and double dipped handle for comfort. Meets or exceeds ANSI standards. Powerful handle magnets feature solid steel construction with welded handles. Durable red powdercoat finish resists scratching. Lifts heavy objects such as shelving, beams and doors. Use to clean up scattered iron objects, such as nails, screws, bolts. 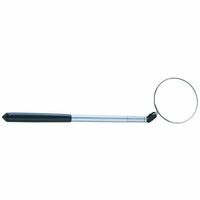 Contains a magnetic tip made from neodymium, the strongest magnetic material available; telescoping body with grip handle and adjustable locking hinge allows access around corners or in areas where an unusual angle is necessary for object retrieval. Extra torque 8650 chrome nickel alloy, heat treated for maximum strength, and rust resist finish. Durable nickel chromium steel construction. Machined jaws for maximum gripping strength. Induction hardened cutting edge stays sharper, longer. ProTouch grips provide extra comfort and reduces hand fatigue. Meets or exceeds ANSI specifications. Made with Eklind alloy steel that has been heat treated for optimum strength and ductility with a black finish to resist rust and a classic steel handle. Includes inch sizes: .050, 1/16, 5/64, 3/32, 7/64, 1/8 , 9/64, 5/32, 3/16. Carded. Made with Eklind alloy steel that has been heat treated for optimum strength and ductility with a black finish to resist rust. Includes MM sizes: 1.5, 2, 2.5, 3, 4, 5, 6, and molded plastic holder. Carded. Made with Eklind alloy steel that has been heat treated for optimum strength and ductility with a black finish to resist rust and a classic steel handle. Includes MM sizes: 1.5, 2, 2.5, 3, 4, 5, and 6. Carded Powerful latch magnet set in durable red plastic casing with four elongated holes allows multi directional and adjustable mounting. Heavy duty door closure latch comes with 1/8" thick steel strike plate with countersunk holes to accommodate flat head screws. Add a hook or a knob and use this magnet for holding and positioning shop lights, tools, plants and more to steel surfaces such as refrigerators, filing cabinets, metal beams, walls and doors. Powerful neodymium magnets encased in colorful plastic shapes are useful for posting memos, invoices and photos. 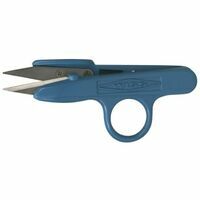 Wiss Sharp Cutter, Contour, Heavy Duty, Series: Quickclip, 1 in Length Blade, PVC Plastic Handle, 4-3/4 in Overall Length Made of forged steel with hardened cutting edges for durability and a rust resistant finish. Double dipped handle for comfort. Meets or exceeds ANSI standards. Add a hook or a knob and use this magnet for holding and positioning shop lights, tools, plants and more to steel surfaces such as refrigerators, filing cabinets, metal beams, walls and doors. Made of forged steel construction with long tempered jaws for working in hard to reach areas. Rust resistant finish. Double dipped handle for comfort. Meets or exceeds ANSI standards. Made primarily from aluminum, nickel, cobalt and iron; powerful and sturdy and includes a keeper to help retain magnetic power. Used by crafters, teachers and do-it-yourselfers for retrieving small steel parts and screws from hard-to-get-at places. Carded. Made of drop forged steel with 33 percent larger cutting edge 45 percent less cutting effort required. Cuts wire and other thin materials. Comfortable bi-material grip. 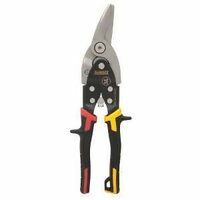 Slip-resistant bi-material handle for a comfortable grip; drop-forged steel is strong and durable; meets ANSI specifications; fixed joint design used for bending, turning and cutting, long nose design for use in hard-to-reach areas. Jaws reverse to change functions. Adjustable wrench: straight-jaws give firm direct contact at top and bottom. Pipe wrench: serrated angles jaws allow a secure turning motion on pipes. Drop forged high carbon steel; chrome plated rust resistant finish; tempered and heat treated for hardness; precisely milled jaws for grip power. Performance Tool Adjustable Wrench, Stubby, 1 in Wrench, 6 in Overall Length, Contoured Handle Mirror is fully polished for crystal clear reflections, dual ball and socket joints permit infinite angle adjustments of the mirror, convenient pocket clip for use in the field. 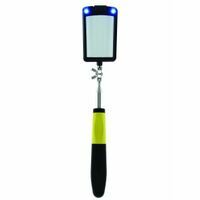 Facilitates inspection of inaccessible work pieces and machines by tool makers, assemblers, inspectors, and mechanics; 1-3/8" diameter inspection Mirror with telescoping shaft extends from 5" to 27-1/2" in length. General Tools Magnetic Pick-up, High Power, 8-3/4 in Length, 2 lb Load Capacity, Steel, Nickel Plated, For Retrieving Steel Parts From Hard-to-Reach places Made from forged steel with rust resistant finish, hardened cutting edges for durability, and serrated jaw for additional grip and leverage. Double dipped handle for comfort. Meets or exceeds ANSI standards. Extra torque 8650 chrome nickel alloy, heat treated for maximum strength, and rust resist finish. Latch magnets feature welded solid steel construction; able to lift, hold and retrieve metal objects up to 100 times their own weight. Can be used to secure gates or doors or as small tool holders, door stops, magnetic clamps and fixture holders, and separate magnetic from non-magnetic materials. 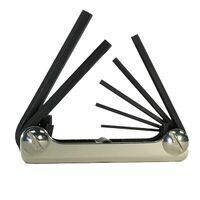 Powerful handle magnets feature solid steel construction with welded handles. Durable red powdercoat finish resists scratching. Lifts heavy objects such as shelving, beams and doors. Use to clean up scattered iron objects, such as nails, screws, bolts. Extra torque 8650 chrome nickel alloy, heat treated for maximum strength, and rust resist finish. Forged from carbon steel and accurately machined, hardened and tempered. Curved jaws combination with machined gripping teeth and wire cutter, 2 jaw positions, bright plated finish and knurled handles. Made with Eklind alloy steel that has been heat treated for optimum strength and ductility with a black finish to resist rust; handle width is 3 inches. Thirty geometric, high energy flexible magnets feature magnetism on both sides and are useful for posting messages on work or tracking boards. Consists of ten of each shape (circle, triangle and square). Each approx. 1.25" tall. Attach an acme threaded standard broom handle to this pre threaded magnetic base; wing nut adjustment for the handle angle. Use to reach tools, nuts, bolts and other ferrous metal items with ease. Handle not included. Made of forged steel with hardened cutting edges for durability and a rust resistant finish. Double dipped handle for comfort. Meets or exceeds ANSI standards. Durable nickel chromium steel construction. Machined jaws for maximum gripping strength. Induction hardened cutting edge stays sharper, longer. ProTouch grips provide extra comfort and reduces hand fatigue. Meets or exceeds ANSI specifications. Extra torque 8650 chrome nickel alloy, heat treated for maximum strength, and rust resist finish. Made with Eklind alloy steel that has been heat treated for optimum strength and ductility with a black finish to resist rust. Includes MM sizes: 1.5, 2, 2.5, 3, 4, 5, 6, 8, 10, and molded plastic holder. Carded. Forged steel construction with rust resistant finish and double dipped handle for comfort. Meets or exceeds ANSI standards. Tempered chrome vanadium steel wrench for fastening or holding nuts and bolts in shop or home. Rust resistant polished chrome finish and a handy hang hole for wall storage. Exceeds ANSI specification. Carded. Durable nickel chromium steel construction. ProTouch grips provide extra comfort and reduces hand fatigue. Right angle teeth grip in all directions for maximum bite. Meets or exceeds ANSI specifications. Made of heat treated, drop forged, chrome vanadium steel. Hardness and torque meets or exceeds ANSI specifications B107.8M. Non slip handle grip. Jaw Opening: 1.04" (26.3mm). Made of forged steel with long tempered jaws for working in hard to reach areas, and a rust resistant finish. Double dipped handle for comfort. Meets or exceeds ANSI standards. 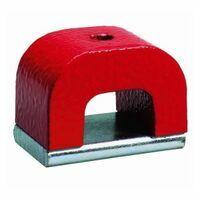 Heavy duty holding and retrieving magnets; each magnet features welded solid steel construction. Attach a rope or rod to magnet?s eyebolt for retrieving. Used for sporting, household, industrial and commercial uses. Eyebolt and nuts included. Designed for grasping, bending and cutting. Oil-resistant dipped handle for a comfortable grip. Drop-forged steel for strength and durability. Meets ANSI specifications. Set includes both 6 in. Slip Joint and 6 in. Long Nose pliers. Drop forged AISI-6150 chrome vanadium serrated edged blades are induction hardened. Meets or exceeds Federal Specifications ANSI/ASME B107.16.1985. Matt grips. Contains neodymium magnet that can retrieve heavy tools, nuts, bolts and other items that are out of reach. Features vinyl handle grip, durable aluminum tubing. Loosen knurled collar and pull bendable shaft to desired length, tighten callor to keep length. Extends from 20" to 36" . 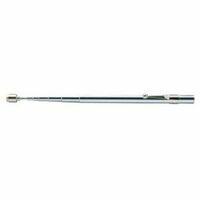 Aluminum shaft that can be bent, twisted and contorted to navigate the most complex work areas; equipped with a high powered Neodymium magnet that is capable of lifting up to two pounds. Used in the automotive, HVAC, machinist and general maintenance professions. Strong four prong steel jaws retrieve small items from hard to reach places. Smooth actuator for greater control, chrome finish to prevent rust, flexible shaft to avoid obstacles Lightweight, strong, 420 stainless steel blades for corrosion resistance. Spring assist action minimizes fatigue. Wire cutting notch in lower blade and thumb latch secures blades closed for storage. Textured, molded handles for secure, comfortable grip. Forged from carbon steel and accurately machined, hardened and tempered. Curved jaws combination with machined gripping teeth and wire cutter, 2 jaw positions, bright plated finish and knurled handles. Made with Eklind alloy steel that has been heat treated for optimum strength and ductility with a black finish to resist rust. Includes inch sizes: .050, 1/16, 5/64, 3/32, 7/64, 1/8 , 5/32, 3/16, 7/32, 1/16, 5/64, 3/32, 1/8 , 9/64, 5/32, 3/16, 1/4, 5/16, and holder. Made with Eklind alloy steel that has been heat treated for optimum strength and ductility with a black finish to resist rust and a classic steel handle. Includes MM sizes: 2, 2.5, 3, 4, 5, 6, and 8. Carded Neodymium magnet with attached keyring is super powerful. Includes a non scratch liner. Used to hang keys or decorations. Made with high-carbon steel; electronic coating for ultimate rust prevention, wire cutting shear; PermaLock fastener eliminates nut and bolt failure and "Channellock Blue" grips for comfort. Made in USA. Machined jaws help grip items securely. Used for grasping or bending small objects. Constructed of high-grade heat-treated alloy steel for maximum toughness and durability with hardened teeth are made to grip from any angle. Curved jaw puts tremendous pressure on four points for any application that requires maximum torque. Classic trigger release provides maximum locking force; built-in wire cutter great for a variety of applications and material shapes. Hex key adjusting screw tightens to adjust pressure and draw materials together and provides a controlled release. Constructed of high-grade heat-treated alloy steel for maximum toughness and durability with hardened teeth are made to grip from any angle. Curved jaw puts tremendous pressure on four points for any application that requires maximum torque. Classic trigger release provides maximum locking force; built-in wire cutter great for a variety of applications and material shapes. Hex key adjusting screw tightens to adjust pressure and draw materials together and provides a controlled release. Machined jaws help grip items securely. 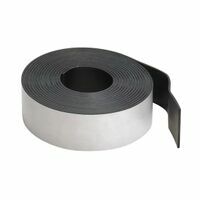 Used in applications such as bending, grasping and cutting hard wire. Heavy duty retrieving magnets with eyebolt and nuts to add on the top or side of the magnet; use to hold, lift and hang objects. Each powerful magnet assembly is encased in bright red nylon casing with black rubber sides. Includes two shields to help retain magnetic power and allows easy storage in a toolbox without attracting other tools. Fully polished glass mirrors are enclosed in plated holders which are attached to knurled handles with ball and socket joints; facilitate inspection of inaccessible workpieces and machines by toolmakers, assemblers, inspectors and mechanics. Mirror diameter 1-1/4", arm length 6". Lens is made of ground and polished optical glass and pivots into case for storage; stores easily in a pocket. Used by machinist, inspectors, jewelers and hobbyists. Carded. Flexible magnetic tape is adhesive on one side, magnetic on the other. Perfect for making lightweight projects magnetic. Can be used in the home, school and office. Forged steel construction, machined jaws for slip-resistant grip, rust resistant finish, and a double dipped handle for comfort. Meets or exceeds ANSI standards. Made with Eklind alloy steel that has been heat treated for optimum strength and ductility with a black finish to resist rust and a ergonomic handle. Includes inch sizes: .050, 1/16, 5/64, 3/32, 7/64, 1/8 , 9/64, 5/32, and 3/16. Carded. Two part ceramic magnet can be used to hold wreaths or other decorations through single-pane windows by placing a magnet on each side of the glass, then hang the decoration. 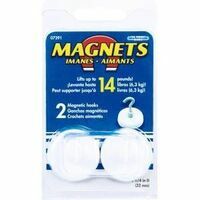 Also used as two single magnetic hooks on metal surfaces. Protective lining helps prevent surface scratching. Stanley Tongue and Groove Plier, Bi-Material, Curved Jaw, 7/8 in Length X 7/8 in Width Jaw, Alloy Steel Jaw, Gloss, Ergonomic, Slip Resistant Handle, 8 in Overall Length, ANSI Specified, 1 in Jaw Opening, 6 Jaw Positions Stanley Diagonal Plier, Bi-Material, 13/16 in Length X 1-7/64 in Width Jaw, Drop Forged Steel Jaw, Ergonomic, Slip Resistant Handle, 7 in Overall Length, Black, ANSI Specified, 17/32 in Tip Width Made with Eklind alloy steel that has been heat treated for optimum strength and ductility with a black finish to resist rust and a ergonomic handle. Includes MM sizes: 1.5, 2, 2.5, 3, 4, 5, and 6. Carded. Stanley Pick Hook Set, Slip Resistant, 6 in Length, 4 Pieces, Includes: Full Hook, Angle Hook, 90 deg Hook and Straight Pick, Steel Shaft, Plastic Grip, For Marking Metal, Punching Holes and Working With O-Rings, Gaskets, Washers and Other Small Parts Master Magnetics Magnet Handle, 4-1/2 in Length, 1 in Width, 3-3/8 in Height, 100 lb Load Capacity, Plastic, Red Retrieve items from dark, hard-to-reach places; continued push opens retrieval claw, ergonomically hand controls, flexible shaft, strong spring steel retrieval claw and push On LED light. Includes: (3) LR41 batteries. Made of forged steel with hardened cutting edges for durability and a rust resistant finish. Double dipped handle for comfort. Meets or exceeds ANSI standards. Constructed of high-grade heat-treated alloy steel for maximum toughness and durability with hardened teeth are made to grip from any angle. Curved jaw puts tremendous pressure on four points for any application that requires maximum torque. Classic trigger release provides maximum locking force; built-in wire cutter great for a variety of applications and material shapes. Hex key adjusting screw tightens to adjust pressure and draw materials together and provides a controlled release. Made with Eklind alloy steel that has been heat treated for optimum strength and ductility with a black finish to resist rust and a classic steel handle. Includes inch sizes: 3/32, 7/64, 1/8 , 9/64, 5/32, 3/16, 7/32, 1/4. Carded. Ergonomic offset head for greater leverage, special jaw accommodates many shapes and PermaLock fastener eliminates nut and bolt failures. Channellock Blue grips for comfort. Made in USA. Ergonomic offset head for greater leverage, special jaw accommodates many shapes and PermaLock fastener eliminates nut and bolt failures. Channellock Blue grips for comfort. Made in USA. Turn screw to adjust pressure and fit work, convenient wire cutter, stays adjusted for repetitive use. Constructed of high-grade heat-treated alloy steel for maximum toughness and durability with hardened teeth are made to grip from any angle. Long, straight nose provides easy access in narrow, hard-to-reach places. Made with Eklind alloy steel that has been heat treated for optimum strength and ductility with a black finish to resist rust and a ergonomic handle. Includes inch sizes: 5/64, 3/32, 7/64, 1/8 , 9/64, 5/32, 3/16, 7/32, and 1/4. Carded. Made with Eklind alloy steel that has been heat treated for optimum strength and ductility with a black finish to resist rust; handle width is 3 inches. Each probe features an extended-length aluminum body with a knurled grip, hexagonal head to prevent rolling and is made with heat treated, high-carbon steel points; 6-1/2" in overall length. Used for picking, marking and cleaning a variety of work surfaces or to remove old gaskets and o-rings during a mechanical repair or to position wires during electrical installations. Includes three probes: 45 degree, double bend, hook bend.". Powerful handle magnets feature solid steel construction with welded handles. Durable red powdercoat finish resists scratching. Lifts heavy objects such as shelving, beams and doors. Use to clean up scattered iron objects, such as nails, screws, bolts. Durable nickel chromium steel construction. ProTouch grips provide extra comfort and reduces hand fatigue. Right angle teeth grip in all directions for maximum bite. Meets or exceeds ANSI specifications. 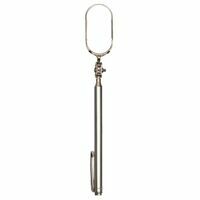 Features the most popular hook and probe styles in a smaller, fixed-length design. The probes are useful for cleaning and marking small work surfaces, as well as for separating and positioning electrical wires. Blades are 2-5/8" in length; overall Length of tool is 6" and Versa-Grip handle for comfort and control. 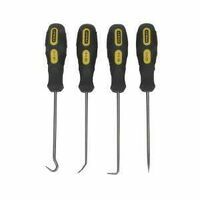 Includes 4 probes: straight probe, 35 degree bend, 90 degree bend, 180 degree hook probe. Durable nickel chromium steel construction. ProTouch grips provide extra comfort and reduces hand fatigue. Right angle teeth grip in all directions for maximum bite. Meets or exceeds ANSI specifications. Made of drop forged steel that is fully polished and heat treated. Tapered jaws for working in tight areas; non-slip vinyl grip. Drop forged chrome nickel steel for durability; fully polished finish resists rust and corrosion; hardened and tempered sharp cutting edges; ergonomic anti-slip cushioned grips for comfort and less hand fatigue; hardness meets or exceeds ANSI standards. Made with high-carbon steel; electronic coating for ultimate rust prevention, wire cutting shear; PermaLock fastener eliminates nut and bolt failure and "Channellock Blue" grips for comfort. Made in USA. Adjustable-width jaw used for grasping and turning, rust resistant chrome finish and machined jaws help grip items securely. Used for plumbing, automotive and general applications. Change easily from internal to external rings. Heavy duty return spring. 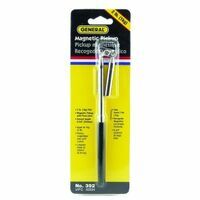 Effective range of 3/8" - 2"; for 6 Internal/External purposes. Includes (3) three convertible tips: 180 degrees, 90 degrees, and 45 degrees. Constructed of high-grade heat-treated alloy steel for maximum toughness and durability with hardened teeth that are made to grip from any angle. One handed, triggerless release is easier to open, anti-pinch, non-slip ProTouch grips, wire cutter. Curved jaw puts pressure on four points. Hex key adjusting screw tightens to adjust pressure and draw materials together and provides a controlled release. Made with Eklind alloy steel that has been heat treated for optimum strength and ductility with a black finish to resist rust. Includes MM sizes: 1.5, 2, 2.5, 3, 4, 5, 6, 8, 10, and moled plastic holder. Right angle, laser heat treated teeth made of high carbon steel for superior performance on the job and electronic coating for rust prevention. Undercut tongue and groove design won't slip, reinforcing edge minimizes stress breakage, PermaLock fastener eliminates nut and bolt failure. Channellock Blue grips for comfort. Made in USA. Locking pliers without wire cutter constructed of high-grade heat-treated alloy steel for maximum toughness and durability. Straight jaws with hardened teeth provide maximum contact on flat, square, or hex work. Guarded release trigger quickly unlocks and protects from accidental release are made to grip from any angle; used for tightening, clamping, twisting and turning. Made of high-grade heat-treated alloy steel for maximum toughness and durability; replaces up to 16 wrench sizes. Heavy duty jaws lock on to three sides of a hex fastener and will not slip or mar; turn screw to adjust pressure and fit work, stays adjusted for repetitive use. Classic trigger release provides maximum locking force. Includes a built-in wire cutter. Made with Eklind alloy steel that has been heat treated for optimum strength and ductility with a black finish to resist rust and a classic steel handle. Includes inch sizes: 3/16, 7/32, 1/4, 5/16, and 3/8. Carded. Made of forged steel with long tempered jaws for working in hard to reach areas, and a rust resistant finish. Double dipped handle for comfort. Meets or exceeds ANSI standards. High-leverage, compound cutting design cuts up to 18 gauge steel. Serrated cutting edges, double overwind spring for longer life, and chrome plated hardware. Latch automatically releases with the squeeze of the handles. Slip-resistant, bi-material cushion grip. Exceeds ANSI standards for cutting performance and durability. One pair replaces two for internal or external use; includes four interchangeable tips for ease in moving from one project to the next; "ProTouch" grips provide extra comfort for less hand fatigue. Simple push of innovative press and slide button adjusts lower jaw 2X faster; multi-groove ratcheting system provides precise jaw positioning to grip any type of surface; anti-pinch, non-slip "ProTouch Grips" provide comfort, control and less hand fatigue; right angle teeth grip in all directions for maximum performance; "Metal Injection Mold" (MIM) process for precision parts delivers strength and performance. Durable nickel chromium steel construction. ProTouch grips provide extra comfort and reduces hand fatigue. Right angle teeth grip in all directions for maximum bite. Meets or exceeds ANSI specifications. Durable nickel chromium steel construction. ProTouch grips provide extra comfort and reduces hand fatigue. Right angle teeth grip in all directions for maximum bite. Meets or exceeds ANSI specifications. V-Jaws with right angle, laser heat treated teeth give you more points of contact on round stock and tubing. Made of high-carbon steel for superior performance on the job and electronic coating for rust prevention. Undercut tongue and groove won't slip, reinforcing edge minimizes stress breakage, PermaLock fastener eliminates nut and bolt failure. Channellock Blue grips for comfort. Made in USA. 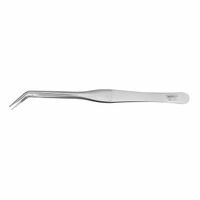 Versatile curved jaw with angled tooth pattern for better grip also features integral wire cutter. Locking C clamps are faster and easier to use. Compound action for powerful non-slip locking grip. Nickel-plated finish resists rust and corrosion. Maximum jaw opening per ASME specs. Assorted scissor set for everyday cutting projects; includes scissor with laser cutting guide; sharp stainless steel stamped blades; durable impact resistant handles 2PC LR44 cell batteries included. Drop forged AISI-6150 chrome vanadium serrated edged blades are induction hardened. Meets or exceeds Federal Specifications ANSI/ASME B107.16.1985. Matt grips. High leverage comfort grip for right or left-handed use. 420 Stainless blades provide maximum corrosion resistance. Serrated lower blade grips materials securely for more even cutting. Adjustable pivot allows fine-tuning to most corrosion resistance. Serrated lower blade grips materials securely. Adjustable pivot allows fine-tuning. Blunt point on lower blade. Semi-circular notch on lower blade. Heavy-duty blade cuts cardboard, heavy fabric, rope, rubber, screen, and more. Made with Eklind alloy steel that has been heat treated for optimum strength and ductility with a black finish to resist rust. Includes Inch sizes: .050, 1/16, 5/64, 3/32, 7/64, 1/8 , 9/64, 5/32, 3/16, 7/32, 1/4, and molded plastic holder. Carded. Nickel-plated finish resists rust and corrosion, angled tooth pattern for better grip, compound action for powerful non-slip locking grip, long nose with wire cutter gets to hard-to-reach spots. Locking C clamps are faster and easier to use than standard clamps. Maximum jaw opening per ASME specs High-leverage, compound cutting design cuts up to 18 gauge steel. Serrated cutting edges, double overwind spring for longer life, and chrome plated hardware. Latch automatically releases with the squeeze of the handles. Slip-resistant, bi-material cushion grip. Exceeds ANSI standards for cutting performance and durability. Turn screw to adjust pressure and fit work, convenient wire cutter, stays adjusted for repetitive use. Constructed of high-grade heat-treated alloy steel for maximum toughness and durability with hardened teeth are made to grip from any angle. Long, straight nose provides easy access in narrow, hard-to-reach places. Locking pliers without wire cutter constructed of high-grade heat-treated alloy steel for maximum toughness and durability. Straight jaws with hardened teeth provide maximum contact on flat, square, or hex work. Guarded release trigger quickly unlocks and protects from accidental release are made to grip from any angle; used for tightening, clamping, twisting and turning. Constructed of high-grade heat-treated alloy steel for maximum toughness and durability with hardened teeth are made to grip from any angle. Curved jaw puts tremendous pressure on four points for any application that requires maximum torque. Classic trigger release provides maximum locking force; built-in wire cutter great for a variety of applications and material shapes. Hex key adjusting screw tightens to adjust pressure and draw materials together and provides a controlled release. 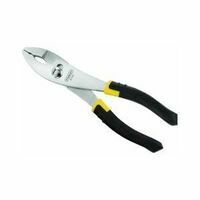 Locking pliers without wire cutter constructed of high-grade heat-treated alloy steel for maximum toughness and durability with hardened teeth are made to grip from any angle. Curved jaw puts tremendous pressure on four points for any application that requires maximum torque. Classic trigger release provides maximum locking force. Hex key adjusting screw tightens to adjust pressure and draw materials together and provides a controlled release. Locking pliers without wire cutter constructed of high-grade heat-treated alloy steel for maximum toughness and durability with hardened teeth are made to grip from any angle. Curved jaw puts tremendous pressure on four points for any application that requires maximum torque. Classic trigger release provides maximum locking force. Hex key adjusting screw tightens to adjust pressure and draw materials together and provides a controlled release. Hot drop-forged steel blades with precision ground edges provide strength, long life and a tight grip. Durable spring washer holds blades tightly against each other when cutting. Duckbill blades for straight and tight curves. Handles are encased in Plastisol and Pro-Touch grips provide superior comfort, resists twisting. Cuts cold rolled steel and stainless steel. Hot drop-forged steel blades with precision ground edges provide strength, long life and a a tight grip. Durable spring washer holds blades tightly against each other when cutting. Flat blades for straight and wide curves. Cuts cold rolled steel and stainless steel. Handles are encased in Plastisol and Pro-Touch grips provide superior comfort, resists twisting. Made with Eklind alloy steel that has been heat treated for optimum strength and ductility with a black finish to resist rust. Includes Inch sizes: 5/64, 3/32, 1/8 , 5/32, 3/16, 7/32, 1/4, and molded plastic holder. Carded. Cuts curves, straight or any combination; cuts low carbon cold rolled steel. Non-slip serrated jaw of molybdenum steel for compound lever action. Spring-action for fast, effortless feed, handle of high tensile strength alloy steel exceeds hand power limit. Non-slip, textured grips and safety latch for superior control. Used to cut screening, hardware cloth, synthetic shingles, tile gutters. Glass mirrors are enclosed in plated holders which are attached to handles with adjustable ball and socket joints. 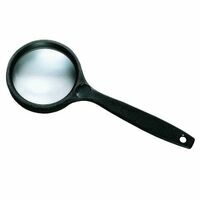 This inspection mirror helps to facilitate inspection of inaccessible workplaces and machines. 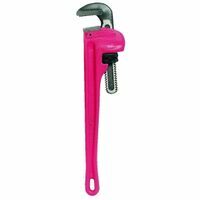 Overall length 10 1/2" extends to 15"; cushion grip handle. Right angle teeth grip in all directions for maximum bite. Simple push of innovative press-n-slide button adjusts lower jaw. Multi-Groove ratcheting system provides precise jaw positioning to grip any type of surface. Anti pinch, non-slip ProTouch Grips provide comfort, control, and less hand fatigue. Tempered chrome vanadium steel wrench for fastening or holding nuts and bolts in shop or home. Rust resistant polished chrome finish and a handy hang hole for wall storage. Exceeds ANSI specification. Carded. High-leverage, compound cutting design cuts up to 18 gauge steel. Serrated cutting edges, double overwind spring for longer life, and chrome plated hardware. Latch automatically releases with the squeeze of the handles. Slip-resistant, bi-material cushion grip. Exceeds ANSI standards for cutting performance and durability. Nickel-plated finish resists rust and corrosion, angled tooth pattern for better grip, compound action for powerful non-slip locking grip, long nose with wire cutter gets to hard-to-reach spots. Locking C clamps are faster and easier to use than standard clamps. Maximum jaw opening per ASME specs Versatile curved jaw with angled tooth pattern for better grip also features integral wire cutter. Locking C clamps are faster and easier to use. Compound action for powerful non-slip locking grip. Nickel-plated finish resists rust and corrosion. Maximum jaw opening per ASME specs. Made of heat treated, drop forged, chrome vanadium steel. Hardness and torque meets or exceeds ANSI specifications B107.8M. Non slip handle grip. Jaw Opening: 1.04" (26.3mm). This product has a push-button locking feature that locks in 3 positions at 90 degree, 135 degree and 180 degree; durable and ergonomic construction with steel side plate for torque (up to 600 in. lbs); soft rubber grip; includes 8 important sizes: 3/32?, 7/64?, 1/8?, 9/64?, 5/32?, 3/16?, 7/32? and 1/4?. Made from forged steel with rust resistant finish, hardened cutting edges for durability, and serrated jaw for additional grip and leverage. Double dipped handle for comfort. Meets or exceeds ANSI standards. General Tools Mechanical Pick-Up, Lighted, Series: UltraTech, Plastic Handle, Black Handle, 36 in Overall Length, Includes: (3) LR-44 Batteries General Tools Magnetic Strip, Flexible, 10 ft Length, 1 in Width, 1/16 in Height, For Sewing, Crafts and Work Benches Made of durable nickel chromium steel with induction hardened cutting edge that stays sharper, longer, machined jaws for maximum gripping strength. ProTouch grips provide extra comfort and reduces hand fatigue. Meets or exceeds ANSI specifications. Constructed of high-grade heat-treated alloy steel for maximum toughness and durability with hardened teeth are made to grip from any angle. Long, straight nose provides easy access in narrow, hard-to-reach places, no-slip ProTouch grip. Turn screw to adjust pressure and fit work, stays adjusted for repetitive use, wire cutter, and FastRelease has a no-trigger release, and offers one hand operation. Constructed of high-grade heat-treated alloy steel for maximum toughness and durability with hardened teeth that are made to grip from any angle. One handed, triggerless release is easier to open, anti-pinch, non-slip ProTouch grips, wire cutter. Curved jaw puts pressure on four points. Hex key adjusting screw tightens to adjust pressure and draw materials together and provides a controlled release. Made with Eklind alloy steel that has been heat treated for optimum strength and ductility with a black finish to resist rust. Includes MM sizes: 2.5, 3, 4, 5, 6, and storage pouch. Made of durable nickel chromium steel with induction hardened cutting edge that stays sharper, longer, machined jaws for maximum gripping strength. ProTouch grips provide extra comfort and reduces hand fatigue. Meets or exceeds ANSI specifications. Made of durable nickel chromium steel with induction hardened cutting edge that stays sharper, longer. ProTouch grips provide extra comfort and reduces hand fatigue. Meets or exceeds ANSI specifications. Push-button locking feature that locks in 3 positions at 90 degree, 135 degree and 180 degree; durable and ergonomic construction with steel side plate for torque (up to 600 in. lbs); soft rubber grip; includes 8 important sizes: 1.5, 2, 2.5, 3, 4, 5, 6 and 8mm. Durable nickel chromium steel construction. ProTouch grips provide extra comfort and reduces hand fatigue. Right angle teeth grip in all directions for maximum bite. Meets or exceeds ANSI specifications. V-Jaws with right angle, laser heat treated teeth give you more points of contact on round stock and tubing. Made of high-carbon steel for superior performance on the job and electronic coating for rust prevention. Undercut tongue and groove won't slip, reinforcing edge minimizes stress breakage, PermaLock fastener eliminates nut and bolt failure. Channellock Blue grips for comfort. Made in USA. Heavy duty cast iron pipe wrench is durable, easy to adjust and use. New, stronger ductile iron material and PowerFlange configuration add additional strength at critical stress areas of the handle. Many parts are interchangeable with other manufacturers? pipe wrenches. Durable epoxy powder coated finish. Right angle, laser heat treated teeth made of high carbon steel for superior performance on the job and electronic coating for rust prevention. Undercut tongue and groove design won't slip, reinforcing edge minimizes stress breakage, PermaLock fastener eliminates nut and bolt failure. Channellock Blue grips for comfort. Made in USA. Right angle, laser heat treated teeth made of high carbon steel for superior performance on the job and electronic coating for rust prevention. Undercut tongue and groove design won't slip, reinforcing edge minimizes stress breakage, PermaLock fastener eliminates nut and bolt failure. Channellock Blue grips for comfort. Made in USA. Self-energizing lower jaw provides 3X more gripping power with no slipping or stripping; provides maximum torque without requiring heavy input pressure; one handed, triggerless release is 2X easier to open; anti-pinch, non-slip "ProTouchGrips" provide comfort, control and less hand fatigue; constructed of high-grade, heat-treated alloy steel for maximum toughness and durability; hardened teeth are designed to grip from any angle; hex key adjusting screw tightens to adjust pressure and draw materials together and provides a controlled release. Self-energizing lower jaw provides 3X more gripping power with no slipping or stripping; provides maximum torque without requiring heavy input pressure; one handed, triggerless release is 2X easier to open; anti-pinch, non-slip "ProTouchGrips" provide comfort, control and less hand fatigue; constructed of high-grade, heat-treated alloy steel for maximum toughness and durability; hardened teeth are designed to grip from any angle; hex key adjusting screw tightens to adjust pressure and draw materials together and provides a controlled release. Blades of quality steel hot drop-forged for sharp edge, long life, rust resistant, and individually hand edged. Cuts straight and wide curves (when trimming light gauge stock); flat face guides tool along straight line. Cuts low carbon cold rolled steel. Cushion grip for comfort. Long nose with wire cutter gets to hard-to-reach spots, angled tooth pattern for better grip, compound action for powerful non-slip locking grip. Locking C clamps are faster and easier to use. Nickel-plated finish resists rust and corrosion. Maximum jaw opening per ASME specs. Made primarily from aluminum, nickel, cobalt and iron; powerful and sturdy and includes a keeper to help retain magnetic power. Used by crafters, teachers and do-it-yourselfers for retrieving small steel parts and screws from hard-to-get-at places. Carded. Forged steel construction, machined jaws for slip-resistant grip, rust resistant finish, and a double dipped handle for comfort. Meets or exceeds ANSI standards. Fully polished glass mirrors are enclosed in plated holders which are attached to knurled handles with ball and socket joints, telescoping arms and vinyl cushion grip handles. Facilitate inspection of inaccessible workpieces and machines by toolmakers, assemblers, inspectors and mechanics. OA length is 11-1/2", extends to 16". Made of drop forged steel with 33 percent larger cutting edge and 45 percent less cutting effort required. Cuts wire and other thin materials. Comfortable bi-material grip. Versatile curved jaw with angled tooth pattern for better grip also features integral wire cutter. Locking C clamps are faster and easier to use. Compound action for powerful non-slip locking grip. Nickel-plated finish resists rust and corrosion. Maximum jaw opening per ASME specs. Self-energizing lower jaw provides 3X more gripping power with no slipping or stripping; provides maximum torque without requiring heavy input pressure; one handed, triggerless release is 2X easier to open; anti-pinch, non-slip "ProTouchGrips" provide comfort, control and less hand fatigue; constructed of high-grade, heat-treated alloy steel for maximum toughness and durability; hardened teeth are designed to grip from any angle; hex key adjusting screw tightens to adjust pressure and draw materials together and provides a controlled release. Constructed of high-grade heat-treated alloy steel for maximum toughness and durability with hardened teeth that are made to grip from any angle. One handed, triggerless release is easier to open, anti-pinch, non-slip ProTouch grips, wire cutter. Curved jaw puts pressure on four points. Hex key adjusting screw tightens to adjust pressure and draw materials together and provides a controlled release. Curved jaws designed for tightening, clamping and turning round objects such as piping or nuts; induction hardened jaws last longer and grip better than non-induction hardened jaws; adjustment screw provides the ideal holding pressure; built-in wire cutter; forged steel is strong and durable; meets ANSI specifications. Made of durable nickel chromium steel construction with induction hardened cutting edge stays sharper, longer. ProTouch grips provide extra comfort and reduces hand fatigue. Meets or exceeds ANSI specifications. Great for cutting: sheet metal (low carbon rolled steel up to 20 gauge), plastics, vinyl, carpet, gutters, cardboard, paper, screen, wire mesh, hose, roof shingles, wallpaper, cloth, leather and more; blade design includes a twine cutter, wire cutter, bottle opener and wire bending holes for added versatility; 3" blade for making long cuts in a wide range of materials; serrated blade helps hold material firmly for better cutting; compound action design delivers 1.5x the cutting power of traditional design for less effort during cutting. Wide capacity jaw allows each tool to work with more fastener sizes; wider handle provides more comfort and less stress to the hand; chrome plating for superior resistance to rust and corrosion; increased knurl diameter for easier adjustment and increased load on fastener to reduce slip-off; laser etched scale provides a quick and convenient way to determine fastener size in either SAE or metric; fully polished face. Made of forged alloy (chrome-molybdenum) with chrome plated hardware. Serrated cutting edges prevent slippage when cutting. Slip-resistant grip. Exceeds ANSI standards for cutting performance and durability. Made of chrome vanadium with English and metric scales, extra wide capacity and hang hole for easy wall storage. Protouch grips reduce hand fatigue. Meets or exceeds ANSI specifications. Right angle, laser heat treated teeth made of high carbon steel for superior performance on the job and electronic coating for rust prevention. Undercut tongue and groove design won't slip, reinforcing edge minimizes stress breakage, PermaLock fastener eliminates nut and bolt failure. Channellock Blue grips for comfort. Made in USA. Compound lever action; cuts 18 gauge low carbon steel; non-slip serrated jaws made of molybdenum steel, self-opening action for fast, effortless feed, safety latch. Colored handles for ease of identification. Length is 9-3/4". Compound lever action; cuts 18 gauge low carbon steel; non-slip serrated jaws made of molybdenum steel, self-opening action for fast, effortless feed, safety latch. Colored handles for ease of identification. Length is 9-3/4". Compound lever action; cuts 18 gauge low carbon steel; non-slip serrated jaws made of molybdenum steel, self-opening action for fast, effortless feed, safety latch. Colored handles for ease of identification. Length is 9-3/4". Made of high-grade heat-treated alloy steel for maximum toughness and durability; replaces up to 16 wrench sizes. Heavy duty jaws lock on to three sides of a hex fastener and will not slip or mar; turn screw to adjust pressure and fit work, stays adjusted for repetitive use. Classic trigger release provides maximum locking force. Includes a built-in wire cutter. Ergonomic offset head for greater leverage, special jaw accommodates many shapes and PermaLock fastener eliminates nut and bolt failures. Channellock Blue grips for comfort. Made in USA. Turn screw to adjust pressure and fit work, convenient wire cutter, stays adjusted for repetitive use. Constructed of high-grade heat-treated alloy steel for maximum toughness and durability with hardened teeth are made to grip from any angle. Long, straight nose provides easy access in narrow, hard-to-reach places. Made with Eklind alloy steel that has been heat treated for optimum strength and ductility with a black finish to resist rust. Includes MM sizes: 1.5, 2, 2.5, 3, 4, 5, 6, 8, 10, and molded plastic holder. Carded. Drop forged AISI-6150 chrome vanadium serrated edged blades are induction hardened. Meets or exceeds Federal Specifications ANSI/ASME B107.16.1985. Matt grips. Wide capacity jaw allows each tool to work with more fastener sizes; wider handle provides more comfort and less stress to the hand; chrome plating for superior resistance to rust and corrosion; increased knurl diameter for easier adjustment and increased load on fastener to reduce slip-off; laser etched scale provides a quick and convenient way to determine fastener size in either SAE or metric; fully polished face. MAXBITE jaw design - 3X gripping force; torque lock faster setup and more force for locking tools; MAXBITE jaw maximizes pressure points for round pipe, hex bolts and many other locking tool applications; control release fast, easy, one-handed release; hardened jaws better grip force on jobsite material; forged alloy steel for maximum tool strength and durability. Heavy-duty forged steel cuts up to 22 gauge cold rolled steel and 26 gauge stainless steel; double dipped slip resistant grip; meets or exceeds ANSI specifications in cutting performance and durability. Heavy duty holding and retrieving magnets; each magnet features welded solid steel construction. Attach a rope or rod to magnet?s eyebolt for retrieving. Used for sporting, household, industrial and commercial uses. Eyebolt and nuts included. Slim head design fits into tight places; push-lock technology with 17 locking positions for faster jaw adjustment; V-Jaw design for multi-purpose gripping; induction heat treated jaws for extra durability; bi-material cushion handle for strong grip and comfort. Flush hardware allows smooth access from pouch; 25% larger pivot bolt than leading competitors for longer tool life; internal locking mechanism with auto release; forged chrome molybdenum alloy providing longer cutting life; gauge cutting capacity: 18 gauge cold rolled steel, 23 gauge stainless steel. Heavy-duty forged steel cuts up to 22 gauge cold rolled steel and 26 gauge stainless steel; double dipped slip resistant grip; meets or exceeds ANSI specifications in cutting performance and durability. Forged steel construction, machined jaws for slip-resistant grip, rust resistant finish, and a double dipped handle for comfort. Meets or exceeds ANSI standards. 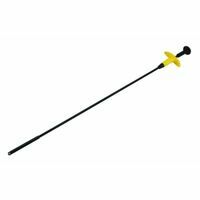 Mini light with neodymium magnetic pick up are both fastened to a stainless steel telescoping wand molded into a rugged high impact ABS plastic handle; telescopes from 7-3/4"-28-3/4". Uses (4) Alkaline, LR41, batteries with a battery life of 48 continuous hours; LED bulb has a life of 100,000 hours of continuous use. Made with Eklind alloy steel that has been heat treated for optimum strength and ductility with a black finish to resist rust and a ergonomic handle. Includes inch sizes: 5/32, 3/16, 7/32, 1/4 , 5/16, and 3/8. Carded Made of durable nickel chromium steel with machined jaws for maximum gripping strength and induction hardened cutting edge that stays sharper, longer. ProTouch grips provide extra comfort and reduces hand fatigue. Meets or exceeds ANSI specifications. Hot drop-forged steel blades with precision ground edges provide strength, long life and a a tight grip. Durable spring washer holds blades tightly against each other when cutting. Flat blades for straight and wide curves. Cuts cold rolled steel and stainless steel. Handles are encased in Plastisol and Pro-Touch grips provide superior comfort, resists twisting. Hot drop-forged steel blades with precision ground edges provide strength, long life and a tight grip. Durable spring washer holds blades tightly against each other when cutting. Duckbill blades for straight and tight curves. Handles are encased in Plastisol and Pro-Touch grips provide superior comfort, resists twisting. Cuts cold rolled steel and stainless steel. Made from forged, hardened and tempered tool steel. Used to grip all shapes like rods, pipes and cable connections. Precision milled ribs for smooth, positive interlock between two halves with no chance of halves separating or jumping out of grooves. Red non slip cushion handle grips. V-Jaws with right angle, laser heat treated teeth give you more points of contact on round stock and tubing. Made of high-carbon steel for superior performance on the job and electronic coating for rust prevention. Undercut tongue and groove won't slip, reinforcing edge minimizes stress breakage, PermaLock fastener eliminates nut and bolt failure. Channellock Blue grips for comfort. Made in USA. Cold formed blades. Easy push up release allows one handed operation. Long life spring for increased durability, lower serrated blade, 12 gauge alloy steel spines provide increased rigidity and less flexing. Cuts 18 gauge cold roll steel and 22 gauge stainless steel. Pro-Touch Grips resists twisting, and will not slip off. Length is 10 inches. Made of chrome vanadium with English and metric scales, extra wide capacity and hang hole for easy wall storage. Protouch grips reduce hand fatigue. Meets or exceeds ANSI specifications. Cold formed blades. Easy push up release allows one handed operation. Long life spring for increased durability, lower serrated blade, 12 gauge alloy steel spines provide increased rigidity and less flexing. Cuts 18 gauge cold roll steel and 22 gauge stainless steel. Pro-Touch Grips resists twisting, and will not slip off. Length is 10 inches. Made with Eklind alloy steel that has been heat treated for optimum strength and ductility with a black finish to resist rust and a ergonomic handle. Includes MM sizes: 3, 4, 5, 6, 8, and 10. Carded. Right angle teeth grip in all directions for maximum bite. Simple push of innovative press-n-slide button adjusts lower jaw. Multi-Groove ratcheting system provides precise jaw positioning to grip any type of surface. Anti pinch, non-slip ProTouch Grips provide comfort, control, and less hand fatigue. Center cut blades, cuts mild steel (Brinel 140) (80,000 PSI) to 5/32" diameter, cuts hard steel (HRC 44) (208,000 PSI) to 3/32" diameter. Do not use cutters on energized circuits, wire, or cable. Steel handle, weighs 1/2 lb. Heavy-duty cast iron housing with drop forged jaw that is heat-treated to resist distortion or breakage, hardened teeth, easy spin adjusting nut, hammer head provides flat surface for hammering. I-Beam handle?s wide provides better weight distribution. Cold formed blades. Easy push up release allows one handed operation. Long life spring for increased durability, lower serrated blade, 12 gauge alloy steel spines provide increased rigidity and less flexing. Cuts 18 gauge cold roll steel and 22 gauge stainless steel. Pro-Touch Grips resists twisting, and will not slip off. Length is 10 inches. DeWalt Aviation Snip, Left, Side Cutter, 18 ga Cold Rolled Steel, 23 ga Stainless Steel Cutting Capacity, 1.4 in Length Blade, Forged Chrome Molybdenum Alloy Blade, 6-1/2 in Handle Length DeWalt Aviation Snip, Right, Side Cutter, 18 ga Cold Rolled Steel, 23 ga Stainless Steel Cutting Capacity, 1.4 in Length Blade, Forged Chrome Molybdenum Alloy Blade, 6-1/2 in Handle Length No-ring scissor is a great utility shear for the home, garden or workshop; features: spring loaded blades for reduced hand fatigue on repeated cuts; heavy duty, stainless steel blades have a Titanium coating that is 3X harder than steel for longer life and durability; precision ground blades for smooth cutting; cuts cardboard, heavy fabric, rope, leather, plastics and more. Titanium coating is 3X harder than steel for longer life; precision ground blades for smooth cutting; stainless steel blades for corrosion resistance; adjustable pivot allows for fine-tuning to most comfortable setting; ergonomic ring design for maximum comfort. Titanium coating is 3X harder than steel for longer life; full-length steel blade extends through the shear for maximum strength; heavy duty premium grade stainless steel blades for extra durability and strength; adjustable pivot allows for fine-tuning to most comfortable setting; ergonomic ring design for maximum comfort. Made of chrome vanadium steel with 4 thread knurl and non-protruding jaws that provide greater capacity; minimal head width improves performance in confined spaces. Measurement scales (in. on front mm. on reverse) are handy for sizing nuts, pipe and tube diameters. Ideal for cutting a range of heavy-duty materials, including light-gauge metals, gutters, vinyl siding, insulation, duct tape, cardborad, rpe, tar paper, fascia, hose and more. "PowerArc" patent-pending technology boasts curved blades that alter the angle between blades to give you over 2X more power, especially during the toughest part of the cut. Offset handle can be used to cut from above or below, keeping your hand away from the materials you're cutting. Heavy-duty stainless steel blades power through thick materials without separation and won't rust. Features a proprietary adjustment screw - jaws won't back off; parallel jaws won't slip or damage finish surfaces; adjustment screw gears designed for smooth adjustment; ergonomic handle form - maximum comfort, won't ding into the palm; chrome plated for rust protection and durability; laser etched ruler for easy-to-read, accurate size adjustment and tether-ready handle loop. MAXBITE jaw design - 3X gripping force; torque lock faster setup and more force for locking tools; MAXBITE jaw maximizes pressure points for round pipe, hex bolts and many other locking tool applications; control release fast, easy, one-handed release; hardened jaws better grip force on jobsite material; forged alloy steel for maximum tool strength and durability. Forged serrated blades bolt lock; chrome plated; flush pivot bolt; one-handed metal lock; ergonomic grips; lanyard hole; up to 22-gauge stainless; 18 gauge cold-rolled steel. Made of chrome vanadium steel for increased durability, heat treated joint rivet for smooth and consistent operation and induction hardened edges for long cutting life. Edge type is Standard, cut capacity is 11 AWG. Compound leverage design that increases cutting power by 50 percent and is 1/3 lighter than standard pliers, reduces fatigue. Co-molded grips for added comfort. Right angle, laser heat treated teeth made of high carbon steel for superior performance on the job and electronic coating for rust prevention. Undercut tongue and groove design won't slip, reinforcing edge minimizes stress breakage, PermaLock fastener eliminates nut and bolt failure. Channellock Blue grips for comfort. Made in USA. Combines long cut of tinner's snips with the strength of compound action. For making long, fast cuts in several types of material. Cuts up to 20-gauge steel. Non-slip, serrated jaws and non-slip textured grips. Forged steel blades with exclusive pinch point wire cutter. Equipped with multiple pivot pins that provide compound cutting action; cuts 18 gauge cold rolled steel and 23 gauge stainless steel. ProTouch grips resist twisting, and will not slip off. Length 9-1/2 inches. Made of chrome vanadium steel with 4 thread knurl and non-protruding jaws that provide greater capacity; minimal head width improves performance in confined spaces. Measurement scales (in. on front mm. on reverse) are handy for sizing nuts, pipe and tube diameters. Serrated cutting edges with high leverage, compound cutting design cuts up to 18-gauge steel. Latch automatically releases with the squeeze of the handles, double overwind spring, chrome-plated hardware and hang hole. Slip-resistant, bi-material cushion grip. Exceeds ANSI standards for cutting performance and durability. 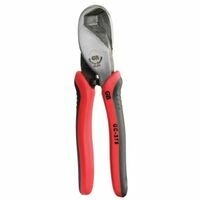 More cutting power over standard cutting pliers; bi-material handles for strong grip and comfort; aggressive cross hatch tooth design for better gripping; Chrome vanadium steel for strength and durability; induction hardened cutting blades for improved strength and durability. 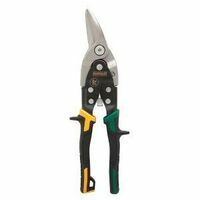 More cutting power over standard cutting pliers; bi-material handles for strong grip and comfort; aggressive cross hatch tooth design for better gripping; chrome vanadium steel for strength and durability; induction hardened cutting blades for improved strength and durability. More cutting power over standard cutting pliers; bi-material handles for strong grip and comfort; aggressive cross hatch tooth design for better gripping; Chrome vanadium steel for strength and durability; induction hardened cutting blades for improved strength and durability. Heavy duty cast iron pipe wrench is durable, easy to adjust and use. New, stronger ductile iron material and PowerFlange configuration add additional strength at critical stress areas of the handle. Many parts are interchangeable with other manufacturers? pipe wrenches. Durable epoxy powder coated finish. 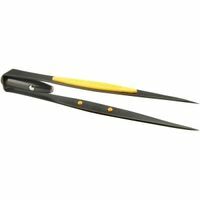 A drop forged carbon steel tool with vinyl grips; it pulls staples, twists wire, cuts wire and hammer too; this multi-purpose tool will help you properly maintain your electric fence. Made with Eklind alloy steel that has been heat treated for optimum strength and ductility with a black finish to resist rust. Includes MM sizes: 1.5, 2, 2.5, 3, 4, 5, 6, 8, 10, and molded plastic holder. Carded. Blades of quality steel hot drop-forged for sharp edge, long life, rust resistant, and individually hand edged. Cuts straight and wide curves (when trimming light gauge stock); flat face guides tool along straight line. Cuts low carbon cold rolled steel. Cushion grip for comfort. Blades of quality steel hot drop-forged for sharp edge, long life, rust resistant, and individually hand edged. Cuts straight and wide curves (when trimming light gauge stock); flat face guides tool along straight line. Cuts low carbon cold rolled steel. Cushion grip for comfort. Made of high grade heat treated alloy steel for maximum toughness and durability, turn screw to adjust pressure and fit work, stays adjusted for repetitive use. Classic trigger release to provide maximum locking force; easier bending, forming, and crimping of sheet metal. Blades of quality steel, hot drop-forged for sharp edge long life, individually hand edged and rust resistant. Cuts moderately tight curves left, right or straight in light stock. Cuts low carbon cold rolled steel. Cushion grip. Heavy-duty cast iron housing with drop forged jaw that is heat-treated to resist distortion or breakage, hardened teeth, easy spin adjusting nut, hammer head provides flat surface for hammering. I-Beam handle?s wide provides better weight distribution. Push-Lock technology ensures jaw stays in place once put in position. Optimized jaw geometry for multiple gripping applications and increased accessibility, 17 button locked positions for heavy duty protection, position locking button with 3 laser etched marking for 3 opening positions. Drop forged construction for durability with induction hardened teeth for strength. Bi Material handles for comfort, grip and control. Long nose with wire cutter gets to hard-to-reach spots, angled tooth pattern for better grip, compound action for powerful non-slip locking grip. Locking C clamps are faster and easier to use. Nickel-plated finish resists rust and corrosion. Maximum jaw opening per ASME specs. Made of nickel chromium steel construction with right angle teeth grip in all directions for maximum bit. ProTouch grips provide extra comfort and reduces hand fatigue. Meets or exceeds ANSI specifications. Forged Chrome-Nickel steel, durable, hand ground cutting edge, machined jaws for gripping, rust-resistant finish with double dipped handles for comfortable use. Includes (1) one each: Cutting, Needle Nose and Slip Joint. Forged steel blades with exclusive pinch point wire cutter. Equipped with multiple pivot pins that provide compound cutting action; cuts 18 gauge cold rolled steel and 23 gauge stainless steel. ProTouch grips resist twisting, and will not slip off. Length 9-1/2 inches. Hold and organize tools in garages, workshops, and work stations. Magnetic tool bar that holds 20# per inch. Easily mounts to walls , studs or workbench. Mounting screws included. 4-color packaging for retail. Cuts up to 18 gauge (1.2mm) cold-rolled steel or 22 gauge (0.7mm) stainless steel. Flush hardware helps prevent catching on materials while cutting. Auto release mechanism provides for fast one handed operation. Induction hardened cutting edge stay sharp longer. Slim head design fits into tight places; push-lock technology with 17 locking positions for faster jaw adjustment; V-Jaw design for multi-purpose gripping; induction heat treated jaws for extra durability; bi-material cushion handle for strong grip and comfort. Multi purpose snips with compound cutting leverage, (duckbill blades, cuts straight and curves), E-Z close latch. Pro-Touch Grips and resists twisting. Cutting sheet metal, vinyl, plastic, rubber and 24 gauge cold rolled steel. Made from forged, hardened and tempered tool steel. Used to grip all shapes like rods, pipes and cable connections. Precision milled ribs for smooth, positive interlock between two halves with no chance of halves separating or jumping out of grooves. Red non slip cushion handle grips. Locking pliers without wire cutter constructed of high-grade heat-treated alloy steel for maximum toughness and durability with hardened teeth that are made to grip from any angle, heavy duty jaws grip around work of all shapes. Turn screw to adjust pressure and fit work, stays adjusted for repetitive use, and classic trigger release provides maximum locking force. Constructed of high-grade heat-treated alloy steel for maximum toughness and durability with hardened teeth are made to grip from any angle. Long, straight nose provides easy access in narrow, hard-to-reach places, no-slip ProTouch grip. Turn screw to adjust pressure and fit work, stays adjusted for repetitive use, wire cutter, and FastRelease has a no-trigger release, and offers one hand operation. ProTouch grips provide extra comfort and reduces hand fatigue. Machined jaws for maximum gripping strength. 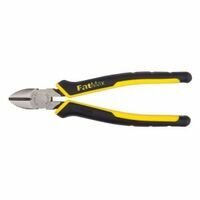 Induction hardened cutting edge stays sharper, longer; includes: (1) 6" Slip Joint pliers and (1) 10" Groove Joint pliers. 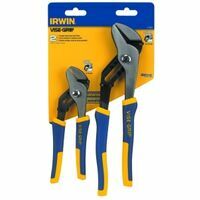 Vise-Grip Plier Set, Groove Joint, 2 Pieces, Includes: 6 in (GV6R) and 10 in (GV10R) Plier, 1-1/8 in, 2-1/4 in Maximum Jaw Opening, Nickel Chromium, Blue/Yellow Handle, ANSI Specified, Ergonomic Handle, For General Mechanical Repair, Plumbing Installation and Repair Goes to work in tight or awkward spaces where full-size aviation snips are challenged; a 3/4" length of cut provides the optimum speed for confined cutting applications where this small, maneuverable snip excels; forged steel jaws with precision-ground serrations on the lower blade product a sharply defined edge for cutting accuracy and control; soft, non-slip grip contours and an easily accessible handle opening compliment the natural power stroke of any size hand; spring-actuated, handles will not collapse. Overall length: 7-1/8". Goes to work in tight or awkward spaces where full-size aviation snips are challenged; a 3/4" length of cut provides the optimum speed for confined cutting applications where this small, maneuverable snip excels; forged steel jaws with precision-ground serrations on the lower blade product a sharply defined edge for cutting accuracy and control; soft, non-slip grip contours and an easily accessible handle opening compliment the natural power stroke of any size hand; spring-actuated, handles will not collapse. Overall length: 7-1/8". Unique total system design requires 20% less force to cut; unique blade serrations spread cutting force across the blade improving cut quality and tool life; industry leading pivot design leads to longer overall snip life; integrated stops make sure the blades open all the way for maximum length of duct; handle design and compound leverage mechanism make cutting easier and reduce hand fatigue. Unique total system design requires 20% less force to cut; unique blade serrations spread cutting force across the blade improving cut quality and tool life; industry leading pivot design leads to longer overall snip life; integrated stops make sure the blades open all the way for maximum length of duct; handle design and compound leverage mechanism make cutting easier and reduce hand fatigue. Unique total system design requires 20% less force to cut; unique blade serrations spread cutting force across the blade improving cut quality and tool life; industry leading pivot design leads to longer overall snip life; integrated stops make sure the blades open all the way for maximum length of duct; handle design and compound leverage mechanism make cutting easier and reduce hand fatigue. Wide capacity jaw allows each tool to work with more fastener sizes; wider handle provides more comfort and less stress to the hand; chrome plating for superior resistance to rust and corrosion; increased knurl diameter for easier adjustment and increased load on fastener to reduce slip-off; laser etched scale provides a quick and convenient way to determine fastener size in either SAE or metric; fully polished face. Titanium coating is 3X harder than steel for longer life; full-length steel blade extends through the shear for maximum strength; heavy duty premium grade stainless steel blades for extra durability and strength; adjustable pivot allows for fine-tuning to most comfortable setting; ergonomic ring design for maximum comfort. Patented flush hardware allows smooth access from pouch. 18-22 gauge cutting capacity. Internal locking mechanism with auto release. Forged chrome molybdenum alloy. Patented flush hardware allows smooth access from pouch. 18-22 gauge cutting capacity. Internal locking mechanism with auto release. Forged chrome molybdenum alloy. Made with Eklind alloy steel that has been heat treated for optimum strength and ductility with a black finish to resist rust. Includes MM sizes: 2, 2.5, 3, 4, 5, 6, and storage pouch. Made with Eklind alloy steel that has been heat treated for optimum strength and ductility with a black finish to resist rust. Includes inch sizes: 3/32, 7/64, 1/8 , 9/64, 5/32, 3/16, 7/32, 1/4, and storage pouch. Slim head design fits into tight places; push-lock technology with 17 locking positions for faster jaw adjustment; V-Jaw design for multi-purpose gripping; induction heat treated jaws for extra durability; bi-material cushion handle for strong grip and comfort. Machined jaws help grip items securely. 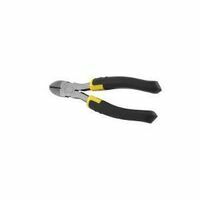 Cutting pliers feature induction hardened cutting edges for long life. Bi-material handles. Includes (1) one each: 6" Diagonal, 6" Long Nose, 6" Slip Joint. Made of chrome vanadium with English and metric scales, extra wide capacity and hang hole for easy wall storage. Protouch grips reduce hand fatigue. Meets or exceeds ANSI specifications. Made of high-carbon steel for superior performance on the job and electronic coating for rust prevention; uses a knife and anvil style cutting edge to ensure perfect mating and superior cutting edge life. High leverage, laser heat-treated cutting edges last longer. Channellock Blue grips for comfort. Made in USA. Made of high-carbon steel for superior performance on the job and electronic coating for rust prevention; uses a knife and anvil style cutting edge to ensure perfect mating and superior cutting edge life. High leverage, laser heat-treated cutting edges last longer. Channellock Blue grips for comfort. Made in USA. Compound action for powerful non-slip locking grip, Long nose with wire cutter gets to hard-to-reach spots, angled tooth pattern for better grip, versatile curved jaw also features integral wire cutter. Locking C clamps are faster and easier to use. Nickel-plated finish resists rust and corrosion. Maximum jaw opening per ASME specs. Includes (1) one each: 7", 10" pliers. Made with Eklind alloy steel that is heat treated for optimum strength and ductility and a black finish to resist rust. 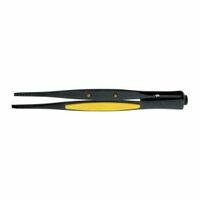 Includes: Long Series Hex-L key set with Holder; inch Sizes: .050, 1/16, 5/64, 3/32, 7/64, 1/8 , 9/64, 5/32, 3/16, 7/32, 1/4 , 5/16, and 3/8, Short Series Hex-L key set with holder; MM Sizes: 1.5, 2, 2.5, 3, 4, 5, 6, 8, and 10. Non-slip serrated jaw of molybdenum steel for compound lever action withstands strain of cutting heavy stock and tight curves. Offset blades keep hands clear of metal and cuts low carbon cold rolled steel. Spring action for fast feed, handle of high tensile strength alloy steel exceeds hand power limit and handy hang-up hole. Non-slip, textured grips and safety latch for superior control. Length is 9-1/4 inches. Non-slip serrated jaw of molybdenum steel for compound lever action withstands strain of cutting heavy stock and tight curves. Offset blades keep hands clear of metal and cuts low carbon cold rolled steel. Spring action for fast feed, handle of high tensile strength alloy steel exceeds hand power limit and handy hang-up hole. Non-slip, textured grips and safety latch for superior control. Length is 9-1/4 inches. Made of drop forged from high carbon, alloy steel for long life and durability; high leverage for heavy use. Provides up to 45 percent less cutting effort with up to a 33 percent longer cutting edge. Bi-material grips provide a comfortable and secure grip. Professional grade tools; "ProTouch" grips provide extra comfort and reduces hand fatigue; machined jaws for maximum gripping strength; induction hardened cutting edge stays sharper; includes (1) 6" Slip Joint Pliers and (1) 6" Long Nose Pliers. Made of durable nickel chromium steel with machined jaws for maximum gripping strength and induction hardened cutting edge that stays sharper, longer. ProTouch grips provide extra comfort and reduces hand fatigue. Meets or exceeds ANSI specifications. Made of chrome vanadium steel with 4 thread knurl and non-protruding jaws that provide greater capacity; minimal head width improves performance in confined spaces. Measurement scales (in. on front mm. on reverse) are handy for sizing nuts, pipe and tube diameters. Right angle teeth grip in all directions for maximum bite. Simple push of innovative press-n-slide button adjusts lower jaw. Multi-Groove ratcheting system provides precise jaw positioning to grip any type of surface. Anti pinch, non-slip ProTouch Grips provide comfort, control, and less hand fatigue. Serrated cutting edges with high leverage, compound cutting design cuts up to 18-gauge steel. Latch automatically releases with the squeeze of the handles, double overwind spring, chrome-plated hardware and hang hole. Slip-resistant, bi-material cushion grip. Exceeds ANSI standards for cutting performance and durability. 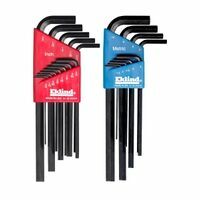 Eklind Hex-L Key Set, Combo, Long, 22 Pieces, Includes: 10213: 13 pc Long Series Hex-L Key Set With Holder Sizes: 0.050, 1/16, 5/64, 3/32, 7/64, 1/8 , 9/64, 5/32, 3/16, 7/32, 1/4 , 5/16 and 3/8 in and 10609: 9 pc Long Series Hex-L Key Set With Holder Sizes: 1.5, 2, 2.5, 3, 4, 5, 6, 8 and 10 mm, 2.8 - 6.8 in Length Arm, L-Shape Handle, Alloy Steel Features a proprietary adjustment screw - jaws won't back off; parallel jaws won't slip or damage finish surfaces; adjustment screw gears designed for smooth adjustment; ergonomic handle form - maximum comfort, won't ding into the palm; chrome plated for rust protection and durability; laser etched ruler for easy-to-read, accurate size adjustment and tether-ready handle loop. Made of chrome vanadium with micro plating finish on jaw; adjustable lock screw stop. Heavy-duty arms and rubber hand grips. Cutting loads meeting Federal Specifications GGG-740D. Made from drop forged from high carbon, alloy steel for long life and durability. Opposing concave cutters are hand finished and induction hardened for long life and clean cuts. Used for cutting coaxial and other soft cables. Bi-material grips provide a comfortable and secure grip. Made of chrome vanadium steel for increased durability with a heat treated joint rivet for smooth and consistent operation. Induction hardened edges for long cutting life. Compound leverage increases cutting power by 50 percent; 1/3 lighter than standard pliers, reduces fatigue. Co-molded grips for added comfort. Tempered chrome vanadium steel wrench for fastening or holding nuts and bolts in shop or home. Rust resistant polished chrome finish and a handy hang hole for wall storage. Exceeds ANSI specification. Carded. Made of high-carbon steel for superior performance on the job and electronic coating for rust prevention; uses a knife and anvil style cutting edge to ensure perfect mating and superior cutting edge life. High leverage, laser heat-treated cutting edges last longer. Channellock Blue grips for comfort. Made in USA. Made of forged alloy tool steel with electronically induction hardened hand-honed, long lasting cutting edges with a polished head. Individually tested for strength and cutting ability. Used for heavy-duty wire cutting. Edge type/cut is Standard; capacity is 12 AWG. Red non-slip cushion handle grips. Made of high-carbon steel for superior performance and electronic coating for rust prevention; uses a knife and anvil style cutting edge to ensure perfect mating and superior cutting edge life. Crosshatch pattern on jaws grips work tightly, laser heat-treated cutting edges last longer, and Channellock Blue grips for comfort. Made in USA. Non-slip, serrated jaw made of tough molybdenum steel withstands strain of cutting heavy stock and tight curves; cuts 16 gauge low carbon steel. Spring-action for fast feed, handle of high tensile strength alloy steel exceeds hand power limit, handy hang-up hole. Non-slip, textured grips and safety latch for superior control. Length 9 1/4 inches. Made of drop forged from high quality diamond steel. Handles and jaws are heat treated, tempered for toughness. Sharp cutting edges are hardened and honed with good leverage; will cut large size nails and wires. Black finish, polished head. Two tools in one: traditional adjustable wrench and locking plier. Forged steel body with jaw grips fastener that won?t slip off. Exceeds ANSI standards for torque. Made of forged alloy tool steel and individually tested for strength. Long needle nose with excellent gripping ability; made for work in tight, narrow areas. Polished head and red non-slip cushion handle grips. Made with Eklind alloy steel that has been heat treated for optimum strength and ductility with a black finish to resist rust. Includes Inch sizes: .050, 1/16, 5/64, 3/32, 7/64, 1/8 , 9/64, 5/32, 3/16, 7/32, 1/4 , 5/16, 3/8, and molded plastic holder. Carded. Hot drop-forged steel blades with precision ground edges provide strength, long life and a a tight grip. Durable spring washer holds blades tightly against each other when cutting. Flat blades for straight and wide curves. Cuts cold rolled steel and stainless steel. Handles are encased in Plastisol and Pro-Touch grips provide superior comfort, resists twisting. Hot drop-forged steel blades with precision ground edges provide strength, long life and a tight grip. Durable spring washer holds blades tightly against each other when cutting. Duckbill blades for straight and tight curves. Handles are encased in Plastisol and Pro-Touch grips provide superior comfort, resists twisting. Cuts cold rolled steel and stainless steel. Made of high carbon steel for superior performance on the job and electronic coating for rust prevention. Uses a knife and anvil style cutting edge that is laser heat treated for longer lasting cutting edges. Channellock Blue grips for comfort. Made in USA. Induction hardened cutting edge stays sharp longer; cross hatched teeth provide an aggressive grip. 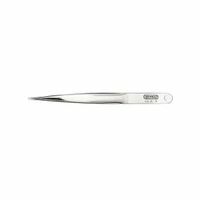 Jaw thickness 7/25", wire cutter 29/50". Pick up nails, nuts, bolts, screws and scrap metal; handle reaches under vehicles, workbenches, and tables. Long reach pliers with compound action joint for increased access in tight spaces; flush rivets for strength and thinner profile; dual material grips for added comfort; milled grooves in tips grip fasteners and other objects tightly. Long reach pliers with compound action joint for increased access in tight spaces; flush rivets for strength and thinner profile; dual material grips for added comfort; milled grooves in tips grip fasteners and other objects tightly. Made from drop forged from high carbon, alloy steel for long life and durability. High leverage pivot for easier cutting. Machined jaw faces used for gripping and twisting wire or other general applications. Bi-material handle provides a comfortable and secure grip. Made of high carbon steel for superior performance on the job; ergonomically designed offset head for greater leverage; special jaw accommodates many shapes; Channellock Blue Grips for comfort. Made in USA. 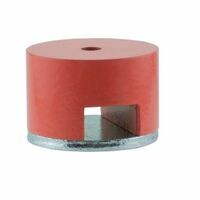 General Tools Power Magnet, Horseshoe Shaped, 3/16 in Core Hole Diameter Diameter, 1-1/2 in Length, 1 in Width, 1 in Height, 22 lb Load Capacity, Alnico, 4 oz Size, For Lifting, Holding, Sorting and Clamping or Retrieving Steel or Iron Parts General Tools Button Magnet, 1-1/4 in Diameter, 3/4 in Height, 14 lb Load Capacity, Alnico, For Heavy Duty Applications Completely adjustable strap wrenches work in the tightest quarters; Urethane-covered, high-strength belting attached to lightweight, I-beam handle; cam-action design permits uniform, high-torque application; under normal conditions will not scratch, damage or deform polished pipe and fittings, plastic pipe and fittings, oil and water filters, glass pipe, PVC conduit and polished shafts; also work on alternator belts, flywheels and propeller assemblies. Allows users to easily extract nails regardless of size or if head is damaged or removed; removes nails easily from front or back of wood; dual handles make it quick and easy to grip, roll and remove nails or staples; forged steel head and handles create a durable tool with rubber grips for comfort and grip. Made of chrome vanadium steel with 4 thread knurl and non-protruding jaws that provide greater capacity; minimal head width improves performance in confined spaces. Measurement scales (in. on front mm. on reverse) are handy for sizing nuts, pipe and tube diameters. Chrome vanadium, hardened and tempered double end shank; hex and ball point for extra reach and leverage. Includes MM sizes: 2, 2.5, 3, 4, 5, 6, 8, and 10. Made of high-carbon steel for superior performance and electronic coating for rust prevention; uses a knife and anvil style cutting edge to ensure perfect mating and superior cutting edge life. Crosshatch pattern on jaws grips work tightly, laser heat-treated cutting edges last longer, and Channellock Blue grips for comfort. Made in USA. Made of forged alloy tool steel. Electronically induction hardened hand-honed, keen side cutting edges, polished head with red non-slip cushion handle grips. Used for reaching confined areas, long chain nose with fine serrated jaws to make wire loops and bends. Made of nickel chromium steel for overall strength and durability. Used to work on metal and wood posts. ProTouch grips provide extra comfort for less hand fatigue. Designed for grasping, bending and cutting small objects. Includes: (1) 4" Diagonal pliers; (1) 4" End cutting pliers; (1) 4" Bent Nose Pliers; (1) 5" Long Nose Pliers; (1) 5" Flat Nose Pliers and (1) 5" Groove Joint Pliers. Made of forged steel with chrome finish and polished head, slide button with debris shield in handle for fast adjustment, SAE/Metric size indicator on jaw. Used for electrical work. Made of forged alloy tool steel that is electronically induction hardened, durable and keen side cutting edges, solid joint, and a polished head. Spring tempered handles with red non slip cushion handle grips. Made of forged alloy (chrome-molybdenum) with chrome plated hardware. Serrated cutting edges prevent slippage when cutting. Slip-resistant grip. Exceeds ANSI standards for cutting performance and durability. For wood and steel posts on ranch or farm. Heavy duty lock joint construction with oval faced jaws. Start and pull point on one jaw with corrugated hammer head on the other. Pulls staples and splices wire stretcher behind joint. Solid drop forged carbon steel blades. Heat treated, milled face design. Non-slip coated green handles. Blades of quality steel hot drop-forged for sharp edge, long life, rust resistant, and individually hand edged. Cuts straight and wide curves (when trimming light gauge stock); flat face guides tool along straight line. Cuts low carbon cold rolled steel. Cushion grip for comfort. Made of drop forged steel with 33 percent larger cutting edge 45 percent less cutting effort required. Lap joint allows for flush cutting while providing knuckle clearance. Comfortable bi-material grip. Made of heat treated, drop forged, chrome vanadium steel. Hardness and torque meets or exceeds ANSI specifications B107.8M. Non slip handle grip. Jaw Opening: 1.04" (26.3mm). Heavy duty cast iron pipe wrench is durable, easy to adjust and use. New, stronger ductile iron material and PowerFlange configuration add additional strength at critical stress areas of the handle. Many parts are interchangeable with other manufacturers? pipe wrenches. Durable epoxy powder coated finish. Wide capacity jaw allows each tool to work with more fastener sizes; wider handle provides more comfort and less stress to the hand; chrome plating for superior resistance to rust and corrosion; increased knurl diameter for easier adjustment and increased load on fastener to reduce slip-off; laser etched scale provides a quick and convenient way to determine fastener size in either SAE or metric; fully polished face. Hold and organize tools in garages, workshops, and work stations. Magnetic tool bar that holds 20# per inch. Easily mounts to walls , studs or workbench. Mounting screws included. 4-color packaging for retail. Features Xtreme Leverage Technology (XLT) for considerably less force required to cut than traditional high leverage designs. The streamlined design is longer for precision handling, while the pipe grip design accommodates many shapes. The angle nose design is ideal for unique situations that require added mobility and control. The streamlined design is sleeker and lighter for easier handling. Made in USA. Features a proprietary adjustment screw - jaws won't back off; parallel jaws won't slip or damage finish surfaces; adjustment screw gears designed for smooth adjustment; ergonomic handle form - maximum comfort, won't ding into the palm; chrome plated for rust protection and durability; laser etched ruler for easy-to-read, accurate size adjustment and tether-ready handle loop. Commonly used for gripping and holding pipes and fasteners; self-adjusting, head design instantly grips and releases pipes and other types of fasteners providing fast, ratcheting action; ideal for most surfaces including black, galvanized, PVC and copper pipe, as well as nuts, bolts and couplings; unique angled tooth configuration for ratcheting applications and better gripping; 5/8 in. - 1-1/2 in. jaw capacity. Made of high carbon steel for superior performance on the job and electronic coating for rust prevention. Uses a knife and anvil style cutting edge that is laser heat treated for longer lasting cutting edges. Channellock Blue grips for comfort. Made in USA. Used for electrical work. Made of forged alloy tool steel that is electronically induction hardened, durable and keen side cutting edges, solid joint, and a polished head. Spring tempered handles with red non slip cushion handle grips. Nickel chrome plated to resist rust. Double action works in both direction; handles have I-beam construction with a 15 inch chain. 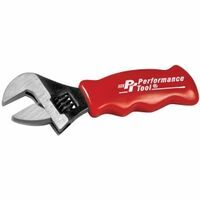 Can be used in many instances where an ordinary pipe wrench will not fit. Made of polished, high carbon, drop forged steel. Broader handles for better leverage and extra comfort; heat treated to hold their edge; cuts up to 4/0 aluminum and 2/0 soft copper. Not for use on steel or ACSR cable. Channellock Blue comfort grips. Made in USA. Made of chrome vanadium with English and metric scales, extra wide capacity and hang hole for easy wall storage. Protouch grips reduce hand fatigue. Meets or exceeds ANSI specifications. 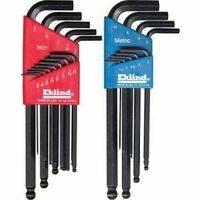 Eklind Hex Key Set, Combo, Fold Up, Series: Classic, 23 Pieces, Includes: 9 Keys: 5/64, 3/32, 7/64, 1/8 , 9/64, 5/32, 3/16, 7/32, 1/4 in and Classic Steel Handle; 7 Keys: 1.5, 2, 2.5, 3, 4, 5, 6 mm and Classic Steel Handle; 7 Keys: T10, T15, T20, T25, T27, T30, T40 and Classic Steel Handle, Alloy Steel, Black Made of high-carbon steel for superior performance on the job and electronic coating for rust prevention, reinforcing edge minimizes stress breakage, undercut tongue and groove design won't slip. Right-angle, laser-heat treated teeth grip better and last longer, PermaLock fastener eliminates nut and bolt failure. Channellock Blue grips for comfort. Includes (1) each: 9 1/2" and 6-1/2 Tongue and Groove plier. Made in USA. Made of steel with black oxide finish that resists rust and corrosion. Easily converts for either external or internal use on snap rings. Push button feature allows for effortless change of ring, hex shape locking guides, spring loaded, broached jaws for tip control and stability, ergonomic anti-slip air pocket grips for comfort. Use pliers on most internal snap-rings 3/8 through 2 inches (9.5 through 50.8mm) and external snap rings 1/4 through 2 inches (6.4 through 50.8mm). Includes: (5) five pairs of color-coded tips in sizes 0.036, 0.047 straight and 90 degree and 0.070 straight. Hex stock size of tips .092". Blades of quality steel, hot drop-forged for sharp edge long life, individually hand edged and rust resistant. Cuts moderately tight curves left, right or straight in light stock. Cuts low carbon cold rolled steel. Cushion grip. Made of high-carbon steel for superior performance on the job and electronic coating for rust prevention. High leverage, curved diagonal cutting pliers with laser heat-treated cutting edges that last longer. Channellock Blue grips for comfort. Made in USA. Made of high carbon steel for superior performance on the job and electronic coating for rust prevention. Laser heat treated cutting edges uses a knife and anvil style cutting edge to ensure perfect mating and superior cutting edge life. Improved high leverage by moving the rivet closer to the cutter means less force required for cutting. Improved XLT, Xtreme Leverage technology, uses considerably less force to cut. Useful crushing area and Channellock Blue grips for comfort. Made in USA. Forged steel construction, machined jaws for slip-resistant grip, rust resistant finish, and a double dipped handle for comfort. Meets or exceeds ANSI standards. Heavy-duty cast iron housing with drop forged jaw that is heat-treated to resist distortion or breakage, hardened teeth, easy spin adjusting nut, hammer head provides flat surface for hammering. I-Beam handle?s wide provides better weight distribution. Made of high carbon steel for superior performance on the job; ergonomically designed offset head for greater leverage; special jaw accommodates many shapes; Channellock Blue Grips for comfort. Made in USA. Detect, locate and identify hidden leaks in wood, concrete, plaster, carpet water leaks in roofs, floors and walls. Provides accurate moisture level readings and are used by home owners, contractors and inspectors. Includes: 9V battery, protective cover. Aluminum alloy handle. Gravity casting with carbon steel drop forged on jaw and carbon steel flat spring. Made of forged alloy tool steel that have electronically induction hardened angled cutting edges and blade sizes. Edge type is standard; cut capacity is 12 AWG. 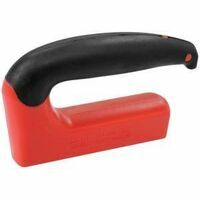 Red cushion grip handles have a leverage ratio to blades for easier cutting. Conform to U. S. Federal Specifications GGG-N-350A, Type 1 Class 2, Style A. Made of of high grade heat treated alloy steel, with classic trigger release that provides maximum locking force. Turn screw to adjust pressure and fit work. Stays adjusted for repetitive use. Chain holds and locks around any shape or size; use for awkward shape pieces. Made of high carbon steel for superior performance on the job and electronic coating for rust prevention. Laser heat treated cutting edges uses a knife and anvil style cutting edge to ensure perfect mating and superior cutting edge life. Improved high leverage by moving the rivet closer to the cutter means less force required for cutting. Improved XLT, Xtreme Leverage technology, uses considerably less force to cut. Useful crushing area and Channellock Blue grips for comfort. Made in USA.